These pancakes would have had a serious identity crisis, if they had been around long enough to say c-r-i-s-i-s. Thankfully, eating at the speed of lightening is among my many talents! These breakfast treats were originally meant to be the luscious Bihari Malpua's. It all started when I read about Vikram's tryst with substandard Malpua's in Pune, and then his explanation on what the Malpua should taste like. The minute I read the description, I knew I had to have it. Vikram had outlined a deceptively simple recipe which went..."Mix this-that, fry, dip in syrup, boom!" So humming to myself, thinking about rich syrupy Malpua's for breakfast, I set to work. Mixed the this and that, let it ferment for a bit, made the syrup, still humming tunelessly, and then when it came to the frying part...well, lets just say this, it wasn't pretty. They just didn't turn out like I had imagined. Soft in the middle, a little crunchy on the outside, dripping with syrup is what I wanted. Thats what it should have been, right? Well, wrong. This is a pretty forgiving recipe. So adjust the proportions according to what looks right to you. The batter should be of pouring consistency, but not too thin. The proportions given here are not exact. Mix everything together till smooth, don't overmix or you will end up with tough pancakes. Let the batter rest for a while, about 10-15 mins. Go do some exercise or something. Seriously, leave it alone! The natural sweetness of the coconut and banana made the traditional maple syrup unnecessary. A light dusting of sugar and a spoonful of honey was all these pancakes needed. The fermentation made the pancaked super soft and fluffy and the cardamom and anise gave it the just the right amount of spice, kicking the pancakes into exotic territory. Since the last one was hardly a recipe, these head over to join the party at Divya's too! Oh that looks sumptuous... i love the flavours going in - coconut, cardamom and banana like nei appam. Hey sweet gud to see u again...pancake looks um..I posted pancake too today..chk tht out ;) so wtsup? LOL on the neighbor part..:D..but they look serious yum dear..! 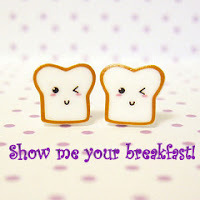 Thanks for sending in your lovely entry to "Show Me Your Breakfast event"! Laavanya, you got it! I was a very desi pancake. Priti, gud to see you too! You pancakse is insane man, the combination of mangoes and pears is so tempting. Vipins, the neighbours have given up on me now. They just take all the weird noises in their stride. TB, Divya, whats up with the the new blog? Knife, you don't want the coconut! (shakes her head in disbelief) Try making the pancakes, super duper easy, esp for a master chef like you. btw..aam breathing deep all the time now..all day..:D..sobs..:(..cant get back..! Great save! If you invited me over for a pancake (hint hint), I would never have known it was an accidental recipe.